The system after the opening of tram line 2 to Doberdó utca. Horse-powered trams: 1888 - 1911. Electric trams: 1911 - today. Kubinszky, M., Lovász, I. & Villányi, Gy. Régi magyar villamosok: A történelmi Magyarország közúti vasutai a kezdettől a II. világháború végéig [Old Hungarian trams: Street railways of historic Hungary from the beginning to the end of World War II]. Budapest: Budapesti Városvédő Egyesület, (1999?). Lehnhart, H. and Jeanmaire, C. Tramway systems of Eastern Europe II. Villigen AG (Switzerland): Verlag Eisenbahn, 1977. 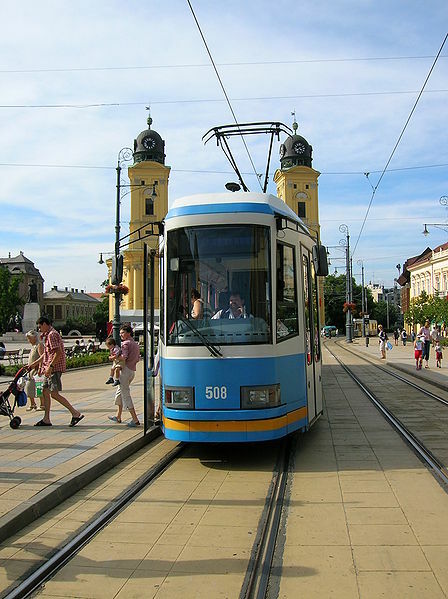 Pulling, N. "Systems Factfile No.108: Debrecen, Hungary" Tramways & Urban Transit, Oct. 2016 (79: 946), p.391-395. Taplin, M.R. "Tramways of provincial Hungary (Parts 1 and 2)", Modern Tramway and Light Railway Review, Nov.-Dec. 1973 (36: 431-432), p.382, 402-404.